Today we want to devote ourselves to the classic marketing concept of the customer journey and the associated map. Your customer’s journey has various stations and each one of them more or less determines whether their journey continues or if the customer abandons it. But first, a little bit of theory. Customer Journey is a marketing term that highlights which stages a customer passes through before he makes a purchase, sends in an order or requests a quote. American advertising strategist Elmo Lewis developed the famous AIDA model back in 1898 to describe the customer journey. This AIDA is not to be confused with the well-known cruise line, although both have to do with travel in the broadest sense. However a customer surely experiences the same steps that are described in the AIDA marketing model, when booking an AIDA cruise. The customer comes across an advertisement for AIDA trips. The customer becomes curious about cruises. The customer wants to take an AIDA cruise. The customer books the cruise. These steps can of course be expanded upon. “Impetus” can be added in between Desire and Action. In this example the customer’s best friend could also book a cruise, and for that reason the customer ultimately takes action. However, in the Information Age the AIDA model quickly reaches its limits. Therefore we are introducing you to a contemporary alternative. Awareness: The customer comes to know about the product through advertising, word of mouth, etc. Consideration: The customer informs himself about the product, for example through reviews or blog posts. Purchase: The customer buys it online or in a store. Retention: The customer keeps the item and informs himself about, for example, certain functions of the product in the FAQs. Advocacy: The customer takes a position in favor of the product. Maybe he writes a review about it on a rating portal. Particularly the information phase (2. Consideration) of the customer journey has become extremely important nowadays. For that reason, we’re taking a detour to the “zero moment of truth.” It is a stage many customers in the Information Age go through when faced with a purchasing decision, and in online retailing it nearly always happens. Mr. Miller is shivering on the platform in the February cold. His train has been cancelled and the next one doesn’t arrive for 15 minutes. Then an advertising poster for a tour operator catches his eye. “How about a quick trip to the sun?” That’s exactly what I’m going to do, thinks Mr. Miller, and pulls out his smartphone. The zero moment of truth happens at this point. Mr. Miller is going to do some research. What do other people have to say about this tour operator? Are there already reviews for the “short trip to the sun” deal? Is the same trip cheaper with another provider? Before customers even consider making a purchase decision, they research the product or service. This has the effect that the first real contact with the product (or experience with the service) no longer becomes the moment of truth. That now happens beforehand. Before the triumph of the internet, Mr. Miller would have had to first personally experience the “short trip to the sun” to be able to assess whether the tour operator’s ad makes an accurate claim. Only after the end of the customer journey could he judge whether his decision to take this trip was a good one or not. Today he finds out through review portals, in blogs or through social media if the trip offered by this travel company is good. But Why the Term “Zero Moment of Truth”? The first moment of truth is described as the point in time where the customer settles on the product. He reaches for detergent brand X in the supermarket, for example. The second moment of truth is when the customer tries out the product. He washes his clothing with detergent X. The third moment of truth is recommending the product (or not). Did he have a good experience with detergent X or did his laundry not really get very clean? The zero moment of truth is called this because it happens before the first one. Through web research and the reading of reviews about the product or service, the consumer has already formed an opinion before the first actual contact. In 70 to 90 percent of cases the consumer has already completed his customer journey before he has even turned to a retailer. Consumer purchasing decisions in 2014 were five times more dependent on internet sources than in 2009. Consumers consult 11.4 sources, on average, regarding a purchase decision. Typical sources are recommendations from friends (online and offline), influencers, blogs, testing reports, comparison portals and field reports. 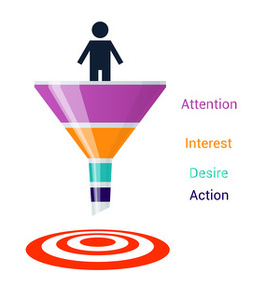 “Attention” and “Interest” are also importations stages of the customer journey. But when you or your offerings fail to be persuasive online, your customer’s journey ends prematurely. Ultimately, the map comprises a list of places where the customer comes into contact with your product or service. In marketing jargon these are called touchpoints. These touchpoints begin with the first contact (Awareness), like when the customer sees one of your ads, and it ideally ends with the use of the product and the customer being convinced by it (Advocacy). Why Apply a Customer Journey Map? When creating a customer journey map, you will be forced to take on the perspective of your customers. Thanks to the map, you can examine and optimize every single touchpoint. In this way you will avoid the customer becoming disappointed at any one point and ending his journey prematurely. You can additionally not only optimize processes, but also generate new product and service ideas based on the map. How is a Map Created? Setting up a customer journey map is an elaborate undertaking, for which there are specialized service providers, as well as very complex and expensive software. But there are more reasonable options, especially at the beginning. The buyer persona is a specific description of a person who could be your customer. It involves a fictitious characterization of one of your customers, whose point of view you assume. In doing so, you can recognize problems in the customer journey at this level. In what environment do they live? Do they have a family, pets, hobbies? Come up with a profile for this person based on your questions. You can of course create several profiles for different people, but one is enough to start with. Now ask yourself at which touchpoints this person will come into contact with your offering. What is their problem? How will they look for a solution? What will they do once they have come upon your offering? Mr. Miller has again accumulated several vacation days and now he needs to take them. He doesn’t want to spend his days off at home. He wants to go somewhere warm where he can be physically active. The first touchpoint could be a Google search for “active vacation in the sun.” The Google search leads him to the second touchpoint. The second touchpoint is perhaps a travel portal, which offers him different kinds of trips. Pictures of Gran Canaria really speak to him, especially ones of the Hotel Del Sol. The third touchpoint could be another search, this time for reviews of the Hotel Del Sol and/or for ratings for this tour operator. A look at the travel operator’s website is conceivable. In addition he checks whether or not there are worthwhile photo subjects on Gran Canaria. The fourth touchpoint is a price comparison of this exact offer. The fifth touchpoint is the booking of this trip with travel operator XY. Of course the touchpoints will look different for another buyer persona. Mrs. Smith may first make an inquiry with her travel agency. Mr. Kowalski makes an appeal to his Facebook friends asking for suggestions. Earned Touchpoints are merited by your offering, if it’s good, perhaps through reviews, press reports, recommendations, etc. Shared Touchpoints are communal touchpoints like how-to videos, e-books or news articles. In the end, for Kevin Miller the appealing landscape photos on your website were the deciding factor for his booking. To avoid losing track of things, and to be able to quickly make additions and changes, you should now create a touchpoint map. To do so, write down the typical stations of a customer journey (ACPRA) and assign the touchpoints to them. These are then expanded with the relevant information on feelings and expectations. Later you can get to know your real customers with quantitative data from sources like Google Analytics, social media monitoring, or customer support questions and returns. You receive qualitative data through interviews or other forms of customer surveys. External sources can also deliver relevant information, like industry reports or studies about customer behavior, and competitive comparisons. You use the qualitative data to suggest theories about your customers. You test these theories based on the quantitative data. On the basis of your theories you can create new personas and come up with a customer journey map for them, or extend the existing map. This way, you expand your original map over time, and in doing so keep your eye on an increasing number of touchpoints. What Absolutely Not to Do? One thing will never happen to anyone who constantly optimizes his customers’ journey and its touchpoints: losing sight of his customers’ needs. There are many examples of this throughout history. Large companies develop neat new products, but in the end only a few people buy them. A current example is the anniversary smartphone from Apple: the iPhone X. Its sales numbers are far below the expectations of analysts. The reason for this was identified in a study by the research division of investment bank Piper Jaffray. 40 percent of potential iPhone X customers are simply already satisfied with the previous model. And 31 percent find the X to be too expensive. So the industry leader has neglected his customer journey at an important step. The customer journey is a large field that offers a whole lot of chances to find and bind customers if it’s “harvested” correctly. Use the customer journey map to recognize strengths and weaknesses in your marketing strategy, and never forget your customer’s perspective. Dieser Artikel wurde am 19.March 2018 von Thomas geschrieben.